TRUMBULL- Over the last month, State Reps. David Rutigliano, Laura Devlin Ben McGorty sponsored a battered, tattered, torn or faded U.S. 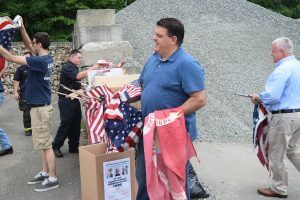 Flag collection which culminated this last Wednesday, June 14 on National Flag Day, where the American Legion Post 141 held a flag retirement ceremony to retire the collected flags at the Indian Ledge Park Maintenance Facility on Whitney Avenue. 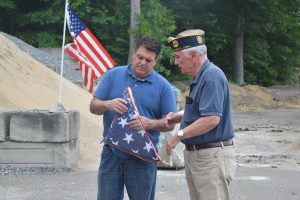 All three Trumbull legislators wanted to acknowledge to assistance of the American Legion Post 141 and especially thank George Areson, who is the Commander of the Trumbull American Legion Post 141 for leading the solemn ceremony. Flag Day, the anniversary of the Flag Resolution of 1777, was officially established by the Proclamation of President Woodrow Wilson on May 30, 1916. While Flag Day was celebrated in various communities for years after Wilson’s proclamation, it was not until August 3rd, 1949, that President Truman signed an Act of Congress designating June 14 of each year as National Flag Day.